Second, we asked those with living mothers to report how many days it had been since their last telephone or face-to-face contact. 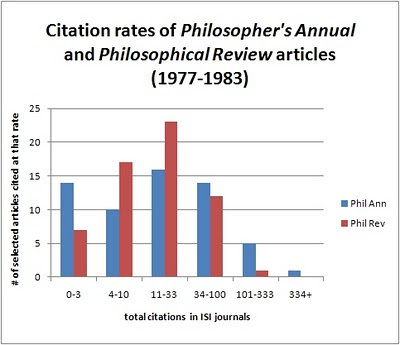 The trend was in the same direction, but only weakly: 10% of ethicists reported its having been more than 30 days, compared to 11% of non-ethicist philosophers, and 8% of ethicists (chi-square, p = .82). We also confirmed that age and gender were not confounding factors. (Older respondents reported less contact with their mothers, even looking just at cases in which the mother is living, but age did not differ between the groups. Gender did differ between the groups -- philosophers being more likely to be male -- but did not relate to self-reported contact with one's mother.) 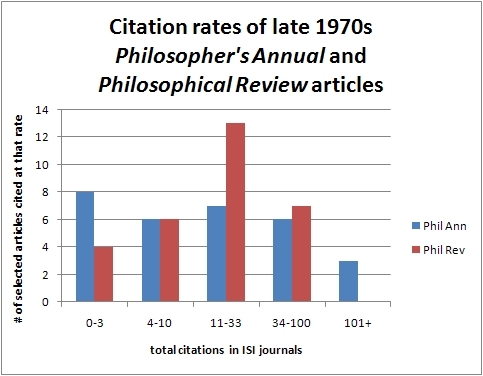 So -- at least to judge by self-report -- ethicists are no more attentive to their mothers than are non-ethicist professors, and perhaps a bit less attentive than professors outside of philosophy. Maybe this isn't too surprising. But the fact that most people seem to find this kind of thing unsurprising is itself, I think, interesting. Do we simply take it for granted that ethicists behave, overall, no more kindly, responsibly, caringly than do other professors -- except perhaps on a few of their chosen pet issues? Why should we take that for granted? Why shouldn't we expect their evident interest in, and habits of reflection about, morality to improve their day-to-day behavior? You might think that ethicists would at least show more consistency than the other groups between their expressed normative attitudes about keeping in touch with mom and their self-reported behavior. However, that was also not the case. In fact the trend -- not statistically significant -- was in the opposite direction. Among ethicists who said it was bad not to keep in at least monthly contact, 8% reported no contact within the previous 30 days, compared to 13% of ethicists reporting no contact within 30 days among those who did not say that a lack of contact was bad. Among non-ethicist philosophers, the corresponding numbers were 6% and 27%. Among non-philosophers, 4% and 14%. Summarized in plainer English, the trend was this: Among those who said it was bad not to keep in at least monthly contact with their mothers, ethicists were the ones most likely to report not in fact keeping in contact. And also there was less correlation between ethicists' expressed normative view and their self-reported behavior than for either of the other groups of professors (8%-13% being a smaller spread than either 6%-27% or 4%-14%). It bears repeating that these differences are not statistically significant by the tests Josh and I used (multiple logistic regression) -- so I only draw this weaker conclusion: Ethicists did not show any more consistency between their normative views and their behavior than did the other groups. Perhaps the ethicists were simply more honest in their self-described behavior than were the other groups? -- that is, less willing to lie or fudge so as to make their self-reported behavior match up with their previously expressed normative view? It's possible, but to the extent were were able to measure honesty in survey response, we found no trend for more honest responding among the ethicists. As I suggested in my previous post, we sometimes have the impression that people do not fully endorse their delusions. In some circumstances, they don’t seem to act in a way that is consistent with genuinely believing the content of their delusions. For instance, a person with persecutory delusions may accuse the nurses in the hospital of wanting to poison him, and yet eat happily the food he’s given; a person with Capgras delusion may claim that his wife has been replaced by an impostor but do nothing to look for his wife or make life difficult for the alleged “impostor”. Some philosophers, such as Shaun Gallagher, Keith Frankish and Greg Currie, have argued on the basis of this phenomenon (which is sometimes called “double bookkeeping”) that delusions are not beliefs. They assume that action guidance is a core feature of beliefs and maintain that, if delusions are not action guiding, then they are not beliefs. Although I have sympathies with the view that action guidance is an important aspect of many of our beliefs, I find the argument against the belief status of delusions a bit too quick. First, as psychiatrists know all too well, delusions lead people to act. People who believe that they are dead Cotard delusion may become akinetic, and may stop eating and washing as a result. People who suffer from delusions of guilt, and believe they should be punished for something evil they have done, engage in self-mutilation. People who falsely believe they are in danger (persecutory delusions) avoid the alleged source of danger and adopt so-called “safety behaviours”. The list could go on. In general it isn’t true that delusions are inert. Second, when delusions don’t cause people to act, a plausible explanation is that the motivation to act is not acquired or not sustained. Independent evidence suggests that people with schizophrenia have meta-representational deficits, flattened affect and emotional disturbances, which can adversely impact on motivation. Moreover, as Matthew Broome argues, the physical environment surrounding people with the delusion doesn’t support the action that would ensue from believing the content of the delusion. The content of one’s delusion may be so bizarre (e.g., “There’s a nuclear reactor in my belly”) that no appropriate action presents itself. The social environment might be equally unsupportive. One may stop talking about one’s delusion and acting on it to avoid incredulity or abuse from others. My view that delusions are continuous with ordinary beliefs is not challenged by these considerations: maybe to a lesser extent than people with delusions, we all act in ways that are inconsistent with some of the beliefs we report - when we’re hypocritical - and we may fail to act on some of our beliefs for lack of motivation - when we’re weak-willed. Suppose that Chloe suffers from a delusion of erotomania and believes that President Obama is secretly in love with her. Chloe has never met him, so how does she know about his feelings? When probed, Chloe may offer no reason in support of her belief or offer reasons that others would consider unsatisfactory or irrelevant (e.g., “He is sending me love messages that only I can decipher”). One explanation is that the belief is so certain for Chloe that she doesn’t feel the need to provide a justification for it. John Campbell argued that at least some delusions play the role of framework beliefs, a notion introduced by Wittgenstein in On Certainty. Framework beliefs (e.g., “The Earth existed long before my birth”) are central to our world-view and become virtually indubitable. They are the pillars on which the rest of our belief system rests, and can’t themselves be justified on the basis of beliefs that are more certain. However, they are manifested in our way of life - we wouldn’t believe our grandparents’ war stories if we thought that the Earth had come into existence at the same time as we did. In my view, delusions are unlikely to play the same role as framework beliefs. Framework beliefs are typically shared by an entire linguistic community, delusions are not. Framework beliefs are perfectly integrated in a belief system, whereas delusions are often in conflict with other beliefs. What puzzles us about those delusions that seem to come out of nowhere is that the person reports them with conviction but doesn’t seem to genuinely endorse them, whereas there is no doubt that framework beliefs are endorsed. Richard Moran developed the notion of authorship which captures the sense in which we know what our beliefs are on the basis of the fact that we endorse their content. We can introspect some of our beliefs. We can infer some of our beliefs from our past behaviour. But at times we know that we believe that p, because we have made our mind up that p based on evidence for p. This mode of knowledge is direct like introspection, but it’s not as passive as perceiving a belief floating around in our stream of consciousness, and doesn’t involve looking inward, but looking outward, at the evidence for p. I know that I believe that the death penalty should be abolished because I have good reasons to believe that the death penalty should be abolished. When I justify my beliefs with reasons that I regard as my best reasons, according to Moran I’m the author of the belief. The notion of authorship combines aspects of rationality and self-knowledge that we tend to take for granted. We expect that, if Chloe is convinced that Obama is in love with her, she must have some reasons to believe that, and she must be able to justify her belief on the basis of those reasons. But in the case of delusions, authorship can be fully or partially compromised. This suggests that people like Chloe experience a failure of self-knowledge. Ten years ago, when I visited the Luray Caverns in Virginia, the tour guide took us down to the deepest cave and turned off the lights. He told us to wave our hands in front of our faces and asked if we could see our hands waving. We could, faintly -- or so we thought. He then asked us to wave our hands in front of our friends' faces. Our friends' hands we couldn't see at all. When we thought we could see our own hands we were fooling ourselves, he said. Not a single photon penetrated that darkness; no light actually came from our hands into our eyes. Call this the spelunker illusion. The existence of this illusion appears to be common lore among avid cave explorers. I have also confirmed it in more pedestrian lightless environments. Yet no psychologist discusses it in any of literature I've reviewed in writing my forthcoming chapter on visual experience in darkness. But surely someone must have written a treatment? If you know of any discussions, I'd appreciate the reference! (1.) The brain's motor output creates hints of visual experience in accord with that output. (2.) Since you know you are moving your hand, your visual system interprets low-level sensory noise in conformity with your knowledge (much as you might see a meaningful shape in a random splash of line segments). (3.) There is no visual experience of motion, but the spelunker mistakenly thinks there is such experience because she expects there to be. There might be other explanations too. I can see how we might start to empirically tease apart the three explanations above. For example, (1) and (2) seem to come apart if you have your friend move your passive hand rather than actively moving your hand yourself. And (3) can come apart from (1) and (2) if we can quash the expectation of experience. Is this a mere curious triviality? Maybe. But the three explanations above do bear somewhat differently on different theories of sensory experience and our knowledge of it. Like other illusions, this illusion promises to reveal something about the hidden operation of the visual system, if it can be properly understood. Leonard Rosgole and Miguel Roig point out to me that these phenomena were reported in the psychological literature in Hofstetter 1970, Brosgole and Neylon 1973, Brosgole and Roig 1983. They have since been confirmed by Dieter et al. 2013. If you're aware of earlier sources, I'd be curious to know. Irrationality is considered a defining feature of delusions in many influential definitions. But in what sense are delusions irrational? Delusions can be procedurally irrational if they are badly integrated in one’s system of beliefs. They can also be inconsistent with other beliefs one has. Lucy who has Cotard delusion believes at the same time that dead people are motionless and speechless, that she can move and talk, and that she is dead. Here there is an apparent inconsistency that is “tolerated”, that it, doesn’t lead her to revise or reject one of the beliefs. Typical delusions are epistemically irrational, that is, they are badly supported by the evidence available to the subject, and they are not adequately revised in the light of new evidence. John who suffers from anosognosia doesn’t acknowledge that one of his legs was amputated and explains the fact that he can’t climb stairs any longer by a violent attack of arthritis. These examples are striking. For many philosophers, the irrationality of delusions is a reason to deny that delusions are beliefs. Lucy can’t really believe that she’s dead, maybe what she means is that she feels empty and detached, as if she were dead. John can’t really believe that he has both legs because there is no problem with his visual perception. Maybe he wishes he still had both legs. This way of discounting delusions as metaphorical talk or wishful thinking is appealing. It is based on the view that there is a rationality constraint on the ascription of beliefs. We wouldn’t be charitable interpreters if we ascribed to Lucy the belief that she’s dead and to John the belief that he has arthritis. I want to resist the idea that people with delusions don’t mean what they say. First, people often act on their delusions and base even important decisions in their lives on the almost unshakeable conviction that the content of their delusions is true. We couldn’t make sense of their behaviour at all if we couldn’t ascribe to them delusional beliefs. Second, the type of irrationality delusions exhibit is not qualitatively different from the irrationality of ordinary beliefs. Delusions may be irrational to a greater extent than ordinary beliefs, and the examples we considered were certainly puzzling, but procedural and epistemic irrationality can be found closer to home. Students believe that wearing clothes of a certain colour will bring them good luck during the exam and nurses believe that more accidents occur in the nights of full moon. These beliefs are certainly inconsistent with other beliefs well-educated people have about what counts as the probable cause of an event. Prejudiced beliefs about black people being more violent are groundless generalisations that can be just as insulated from evidence and as resistant to change as clinical delusions. Maybe what makes delusions so puzzling is only that they are statistically less common (not necessarily more irrational) than other procedurally and epistemically irrational beliefs. Marc Hauser, author of Moral Minds, is now on leave from Harvard after an inquiry finds evidence of scientific misconduct. In the last five years I have been working on the nature of clinical delusions, and have asked what they can tell us about the philosophy and psychology of belief. Clinical delusions are a symptom of a variety of psychiatric disorders, among which are schizophrenia and dementia. Some delusions have fairly mundane content, such as delusions of persecution or jealousy. Other delusions are very bizarre, and people may come to assert that they are dead (Cotard delusion) or that their spouse or family member has been replaced by an impostor (Capgras delusion). In the Diagnostic and Statistical Manual of Mental Disorders (American Psychiatric Association DSM-IV-TR, 2000), delusions are defined in epistemic terms, as beliefs that are false, insufficiently supported by the available evidence, resistant to counterevidence and not shared by other people belonging to the same cultural group. In the philosophical literature it is an open question whether delusions should be considered as genuinely instances of belief. According to the two-factor theory of delusions, delusions are explanatory hypotheses for an abnormal experience which is due to brain damage. The first factor contributing to the formation of the delusion is a neuropsychological deficit and the second factor is an impairment in the evaluation of hypotheses. Imagine that, overnight, Julia’s sister appears different to Julia, and this is powerful experience. One possible explanation is that an alien has abducted Julia’s sister during the night and replaced her with an almost identical replica without anybody else noticing. This hypothesis is implausible and even Julia would consider it as highly improbable, but if her hypothesis-evaluation system doesn’t work properly and doesn’t dismiss it, Julia may endorse it as something she truly believes. As a result, she may become hostile and even aggressive towards the alleged impostor. Even from the oversimplified example above, one can see where the tension is. On the one hand, delusions seem to be just like any other beliefs. They are reported with sincerity and they can affect the person’s other intentional states and behaviour. They “make sense” of a very unusual experience. On the other hand, there is a neuropsychological deficit at the origin of delusions that is not present in the non-clinical population. The affective channel of Julia’s facial recognition process is damaged. The good functioning of the hypothesis-evaluation system is also compromised, maybe due to exaggerated versions of common reasoning biases. Julia “jumped to conclusions” as she accepted her initial hypothesis on the basis of insufficient evidence and without considering other, more probable, alternatives. This unusual aetiology and the apparent extreme irrationality might seem to be in tension with the view that delusions are “beliefs” in the ordinary sense of that term. However, in my view, the main difference between clinical delusions and other irrational beliefs is that delusions severely undermine well-being. People with schizophrenia are often isolated and withdrawn and their life plans are disrupted. But on purely epistemic grounds we can’t easily tell delusions apart from the false beliefs that we ourselves report and ascribe to others on an everyday basis, such as: “Women make poor scientists” or “I failed the exam because the teacher hates me”. Irrationality is indeed all around us. (with Blake Myers-Schulz) now available in draft here. The standard view in contemporary epistemology is that knowledge entails belief. Proponents of this claim rarely offer a positive argument in support of it. Rather, they tend to treat the view as obvious, and if anything, support the view by arguing that there are no convincing counterexamples. We find this strategy to be problematic. In particular, we do not think the standard view is obvious, and moreover, we think there are cases in which a subject can know some proposition P without (or at least without determinately) believing that P. In accordance with this, we present four plausible examples of knowledge without belief, and we provide empirical evidence which suggests that our intuitions about these scenarios are by no means atypical. This research was previously summarized in this post. The current version presents the issues and results in more detail and includes some new controls to address objections raised in the comments to the earlier post.